Alpina has launched the D3, which it is calling the world’s fastest production diesel car with a top speed of 173mph and a 0-62mph time of 4.6 seconds. Essentially the D3 is a BMW 3 Series 330d, but with plenty of modifications to improve performance and luxury. Power is 350PS and peak torque is a huge 700Nm, but despite that, CO2 emissions are 139g/km and average claimed economy is 53.2mpg. Prices start at £46,950 for the saloon and £49,950 for the Touring estate model and order books are open now. 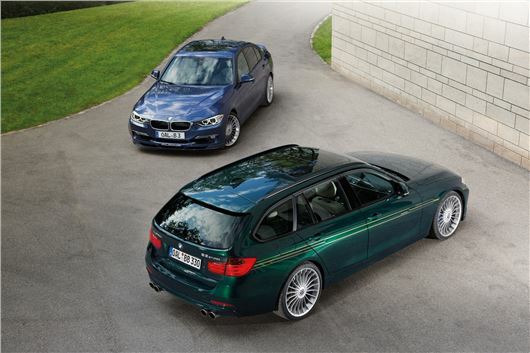 Both saloon and estate variants get a decent level of standard kit including an eight-speed automatic gearbox and M Sport suspension, along with bespoke Alpina details like embroidered leather, a unique instrument binnacle and the trademark Alpina multispoke alloy wheels. There’s also a range of customisation options for interior and exterior colours and materials. While a high performance car might not cross the minds of a typical business customer, the emissions of the Alpina D3 give it a BIK rate of 22 per cent - which means business users can enjoy serious performance and pay about half the company car tax they would for a petrol-powered model with similar performance. A 40 per cent tax payer would pay £344.66 per month.